The newest additions to the Tesira product family are now shipping! Each TesiraFORTÉ VT and TesiraFORTÉ VT4 device combines the power of VoIP and POTS, along with all the great features you’ve come to enjoy in TesiraFORTÉ, into one model. TesiraFORTÉ VT includes three models: a non-networked version, an AVB version, and a Dante™ version. The TesiraFORTÉ VT4 is available in an AVB version and a Dante version. Best of all, you’ll enjoy the benefits of the new TesiraFORTÉ VT for the same price as the TesiraFORTÉ VI and TI! The TesiraFORTÉ VT combines both standard telephone service and a 2-line VoIP interface together in one solution, giving customers a choice between these technologies and soft codec calls via USB audio without any additional costs. The VT brings all this technology together so if there’s ever a need to update a telephony platform, you won’t have to upgrade your DSP solution. As conferencing solutions continue down the path of all digital, analog I/O becomes less of a requirement. The TesiraFORTÉ VT4 takes all the power of a standard TesiraFORTÉ product and reduces not only the price, but also the analog I/O, making it a perfect solution for digital microphones or for installations requiring less analog I/O. 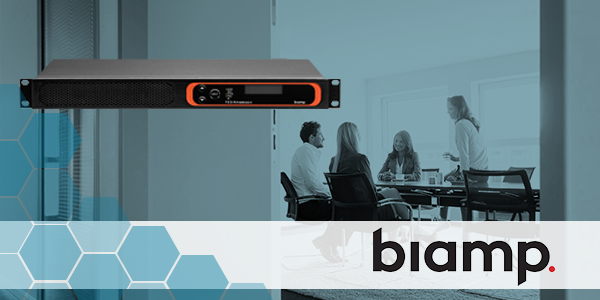 The VT4 offers customers a choice between AVB/TSN and Dante technologies – allowing them to select the model that best fits their conferencing needs. For more information on TesiraFORTÉ®, visit biamp.com/tesiraforte.